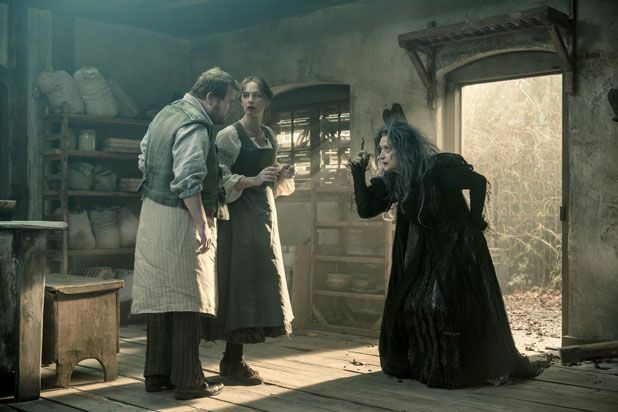 There's a sequence in Disney's adaptation of stage musical Into the Woods which will rank as one of the greatest movie moments of 2015. As Cinderella's Prince and Rapunzel's Prince respectively, Chris Pine and Billy Magnussen engage in an emotionally competitive sing off about love. Their version of 'Agony' is both hilarious and self aware, and how refreshing it is to see male characters reduced to mere love interests. It's also the high point in a film which, given its story and cast, is surprisingly pedestrian. Adapted by original playwright James Lapine and directed by Chicago's Rob Marshall, the story riffs on a number of fairy tales, bringing together Little Red Riding Hood (Lilla Crawford), Cinderella (Anna Kendrick), beanstalk-climber Jack (Daniel Huttlestone) and Rapunzel (Mackenzie Mauzy). They all collide in the story of a baker (James Corden) and his wife (Emily Blunt) who take on a challenge set by the local witch (Meryl Streep). If they are able to collect all the items in her wish-list – a cape as red as blood, a cow as white as milk, etc – she will lift the curse which prevents them from having a baby. And so into the woods they go, where twists in fate await them all. Fairy tales are ripe cinematic fodder; full of peril and dark moral lessons, they can be easily moulded and updated. Throw in some clever, catchy Stephen Sondheim numbers and a stellar cast and success seems guaranteed. But while there are moments of brilliance, including another phenomenal performance from Streep and British charm from Blunt, the story is overlong and eventually it begins to drag before positively limping into a damp squib finale. And Johnny Depp's much-hyped cameo as the Wolf is just another (uncomfortable) variation on the Jack Sparrow theme; indeed, he's in danger of becoming a parody of himself. Of course, musicals are an acquired taste, and if you're a fan this solid and loyal adaptation is likely to please. It's just not sparky or involving enough to win over any new fans. General release from Fri 9 Jan.